In recent years, changes have swept through the investment industry like wildfire. Academia has followed along and provided new lenses for viewing this transformation, as well as new strategies for gaining a true understanding and knowledge of investment and financial markets. Now, Equity Markets and Portfolio Analysis has been created to further inform investment professionals and finance students on the basic concepts and strategies of investments, and to provide more detailed discussions on advanced strategies and models. The concepts covered in this book will help readers gain a better understanding of the markets and uses for an increasing number of securities, strategies, and methodologies. 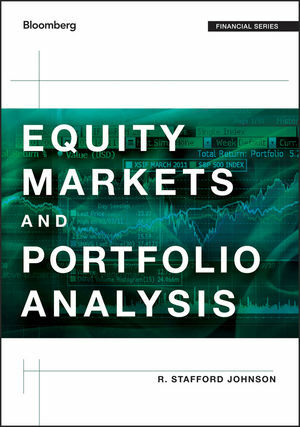 Equity Markets and Portfolio Analysis is the only core investment book that covers the functionality of Bloomberg terminals, increasingly critical tools both in the classroom and on the trading floor. As Bloomberg terminals now play a key role in the research, teaching, and managing of student investment funds, understanding the system's information and analytical functions has become more important than ever. This unique resource will give readers both the foundational knowledge and the analytical tools necessary for investment success, both in the classroom and in the real world. R. STAFFORD JOHNSON is Professor of Finance at the Williams College of Business, Xavier University. He is the author of five books: Options and Futures, Introduction to Derivatives, two editions of Bond Evaluation, Selection, and Management, and Debt Markets and Analysis. He has also written articles appearing in journals such as Applied Economics, Journal of Financial Education, International Review of Economics & Business, Journal of Economics, The Financial Review, and the Review of Quantitative Finance and Accounting.